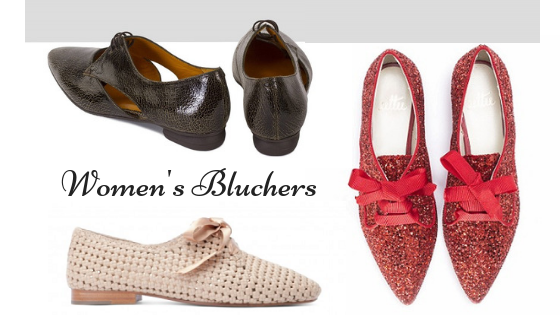 Women’s bluchers are semi-casual lace-up shoes that go particularly well with pants, pant suits, skirts, and tunics. 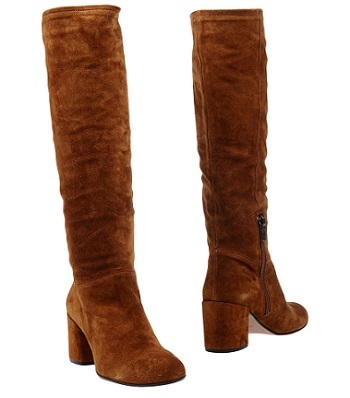 They are perfect for the dry days of fall and spring. This originally masculine shoe was invented a few centuries ago as improved military wear, so you could say that the blucher was the 18th century version of the combat boot. 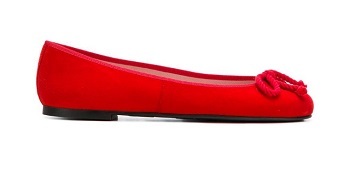 I especially like the “semi-open” women’s bluchers, like the one below, made by the Spanish brand Audley. The open areas in the front and on the sides make them look light and sensuous – not an easy thing to do with a lace-up shoe. 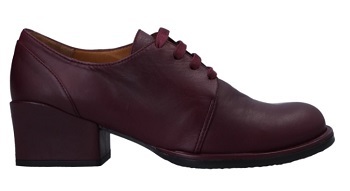 “Leonor” semi-open women’s blucher shoe by Audley. Rounded 0.6” heel. Crackled leather, leather lining. $115.70 on the brand website. Bluchers (they are also often called Derby shoes) have “open lacing“. This simply means that the eyelet tabs, where the laces are strung through, are not drawn together at the bottom. This gives the blucher a more relaxed look, in contrast to the “straight laced” Oxford shoe style. “Leonor“ semi-open blucher shoe by Audley of Spain. Dark caramel colored crackled effect leather, matching laces. Serrated sole. This blucher by Audley stands out for many reasons: the elegant shape, the beautiful caramel-colored crackled effect leather, and, last, but not least, the cute tabular heel. 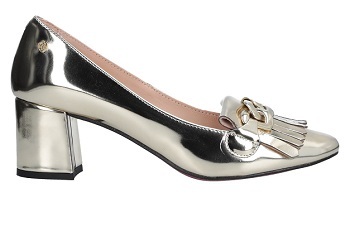 To me, the “Leonor” blucher strikes a great balance between practicality and chic. 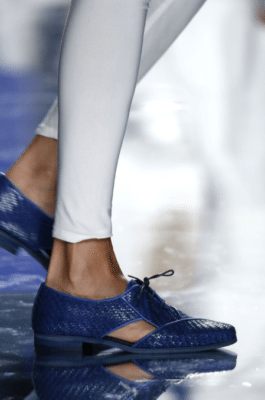 A couple of years ago, during Mercedes-Benz Madrid Fashion Week, I saw some spectacular semi-open style women’s bluchers designed by Angel Infantes – a manufacturer of formal footwear for men (it also makes small collections for women). The brand is based in Almansa, a region with a rich shoemaking tradition. 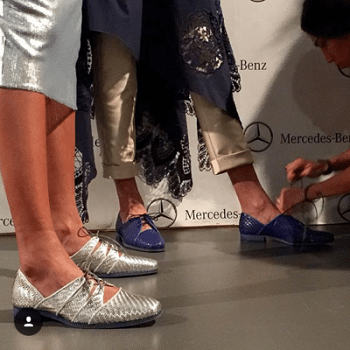 Woven metallic sheen leather bluchers by Angel Infantes for Ulises Mérida SS17, backstage at the Mercedes-Benz Fashion Week Madrid. 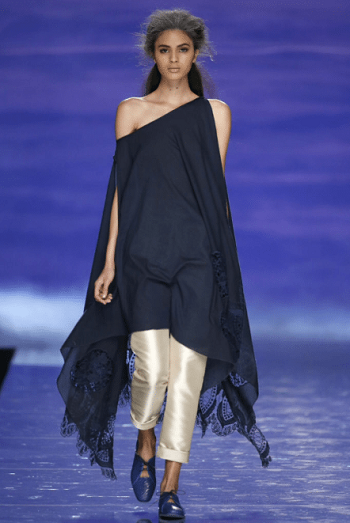 Ulises Mérida SS17 at the MBFW Madrid. Woven leather bluchers by Angel Infantes. Woven leather bluchers Angel Infantes by Ulises Mérida SS17 at the MBFW Madrid. Photo: Vogue Spain. These fantasy bluchers were designed for the Spring-Summer 2017 collection by Ulises Mérida, a well-known Spanish fashion designer. I was so smitten with them – especially the fact that they were made of woven leather – that I contacted Angel Infantes to see if they actually sold these shoes. To my regret, they did not – the bluchers had been designed and created specifically for the show. Too bad, but it is still nice to know that women’s bluchers as beautiful as that were thought up and made reality by expert artisan hands. Woven leather blucher with satin laces by Lottusse SS18. The Spring-Summer 2018 woven leather blucher by the high-end Mallorca-based brand Lottusse is a delicate wonder. The light peach, almost creamy color is incredibly subtle, while the matching satin laces add some extra sheen. I’m also, of course, a huge fan of the net-like woven leather texture – a hallmark of the Balearic islands shoe making tradition. It makes cut-outs like in the “semi-open” Audley blucher above superfluous – this blucher is seductive and airy enough as it is. 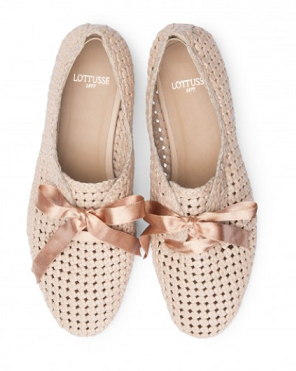 Summer woven leather women’s bluchers by Lottusse. These Lottusse bluchers also came in lavender blue. I’m referring to the bluchers in the past tense because the brand just took them off their website to make room for the winter collection. Such a pity! 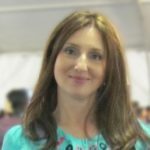 I always try to include shopping links with the pictures. My only hope is that Lottusse still has some stock left and that it will eventually unload it onto some discount websites. I’m pretty sure that these lacy bluchers are still available in shoe stores around Spain and some other European countries. Will keep my eyes peeled for them! Leather lace-up shoe by Audley. 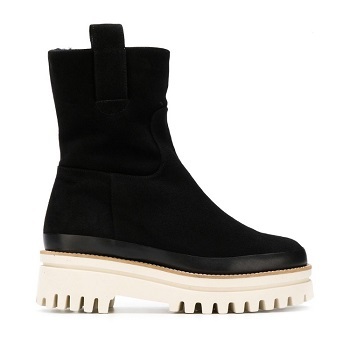 $174 on YOOX. To buy, click on the image. This interesting looking lace-up shoe by Audley is currently available on YOOX. I’m not sure whether it is technically a blucher, but it has that semi-casual look that women’s bluchers are known for. 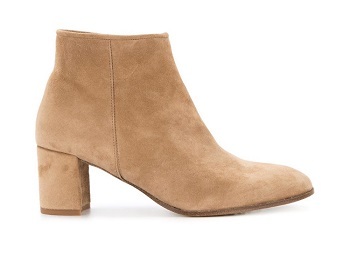 Buying from YOOX is a fun and safe experience and it continues to be the retailer that carries the most Spanish shoes online. 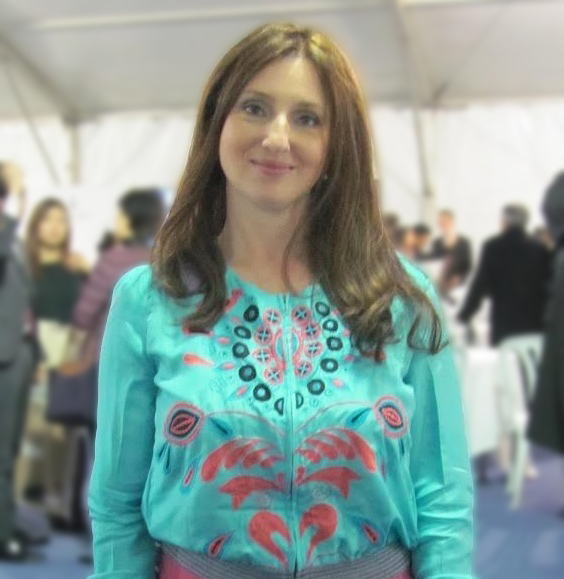 This blog is proud to be affiliated with YOOX. All it means is that if you click on a YOOX product on this website and end up making a purchase, the (fully independent) Spanishoegallery Blog will receive a small (3%) commission. Paloma Barceló polished leather women’s bluchers. 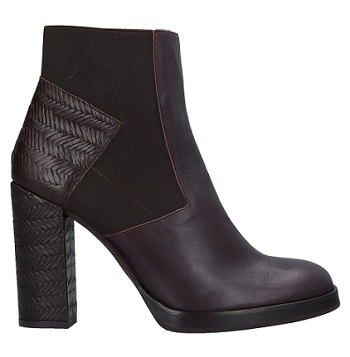 Geometric pattern 3.32″ heel. 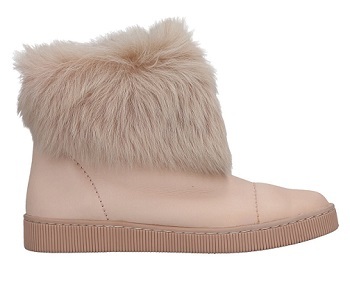 $141 on YOOX. To see if your size is available, click on the image. 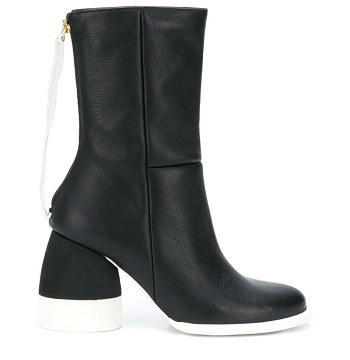 Paloma Barceló is known for its avant-garde urban styles and these high-heeled bluchers are no exception. They are currently on sale, with many sizes still available. On the other end of the spectrum, here is a pair of glitter women’s bluchers color of crushed strawberry courtesy of Uttu Shoes. 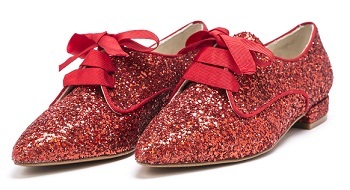 Red glitter bluchers by Uttu Shoes. 1” heel, ribbed grosgrain laces. Currently on sale at 71.40 Euros on the Uttu website. 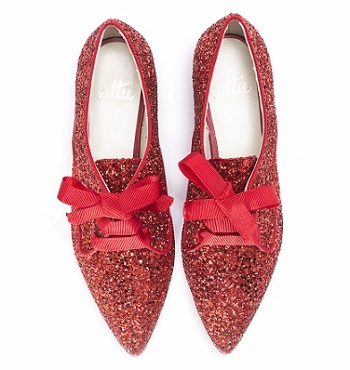 These red glitter bluchers by Uttu Shoes look like something Dorothy from the Wizard of Oz would have fancied. Aslo available in silver. Uttu Shoes is a relatively young Spanish brand that specializes in making women’s bluchers. In previous seasons they had more color and texture versions, which I would love to see come back. I would also love to try on a pair of these pointy bluchers to see how comfortable the fit is. The brand website does mention that it delivers abroad – you would probably need to send them an email to request an international delivery. 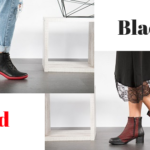 Women’s bluchers are so versatile these days that no matter how “girly” or feminine your style is, you will find a pair that fits your wardrobe, not to mention steals your heart. Practical and attractive as it can be, the blucher greatly expands women’s fashion choices. Do you own any bluchers? I’d love to see how you wear them – please leave comments and links below.